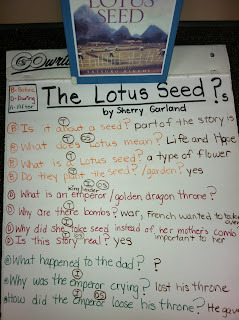 On Friday we read the book The Lotus Seed by Sherry Garland. This books is about a young girl forced to flee her beloved Vietnam to escape a devastating civil war, a woman takes only her children and a single lotus seed to remember the emperor by. Years later, when her grandson takes the seed, she thinks all is lost until the beautiful lotus blossom reminds her of home and gives her grandchildren something to remember her by. This story will help readers appreciate those who must start anew without forgetting their past. As we were reading the kids practiced everything they have been learning about making meaningful questions. I am very proud of them. The questions they had before we read the book were insightful. They were in tune with the new vocabulary that was being put in front of them. As we were in the middle of book the kids had lots of questions about Vietnam, war and the lotus plant. When we finished the book we went back and answered our questions. There were a few we were unable to answer using the text/book or inferring. So we got out the IPad and looked up Vietnam on the map and talked about where it is in comparison to the United States. We also looked up images of a lotus seed/plant. Then we looked up who was the emperor and viewed a picture of him. Take a look at the picture below to see a map of our thinking that day. Our Outside Resources for this book..